I recently received an e-mail from my good friend, Ellen, suggesting that I check out a product called “Yonanas” which has been selling out like crazy at Bed, Bath and Beyond. 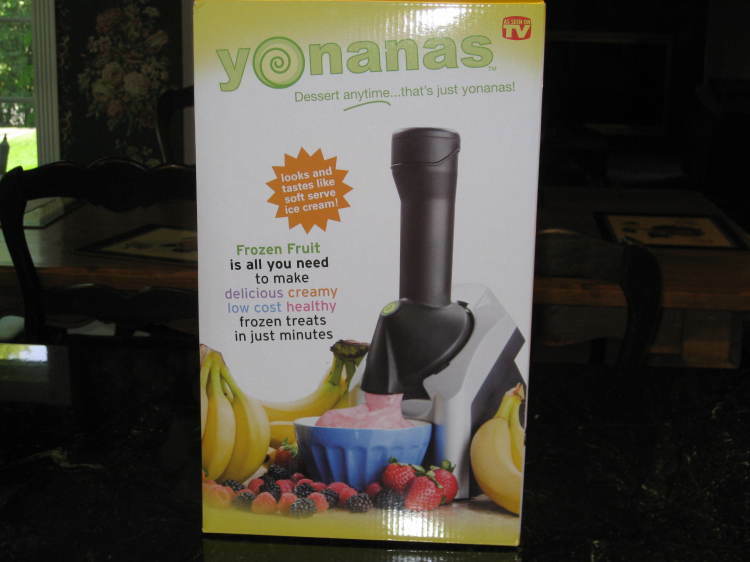 “Yonanas” is an appliance which turns frozen fruit into an “ice cream-like” dessert when chunks of frozen fruit are pushed through a chute with a plunger. Since I am not in love with most of the non-dairy ice creams sold in the store because they are processed, I decided to give the “Yonanas” a try. I had to order mine on-line since my local Bed, Bath and Beyond was sold out. 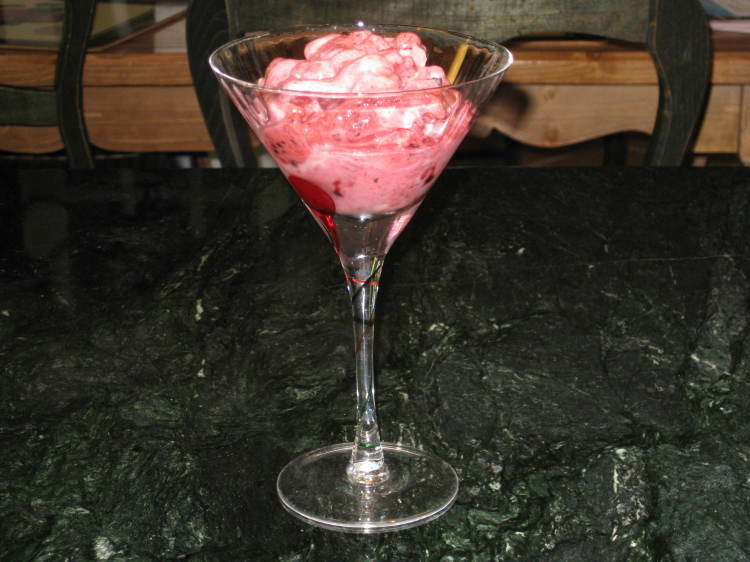 Although you could make a “Yonanas” dessert from any combination of frozen fruit, the instruction manual indicates that adding frozen bananas makes it creamy like a soft serve ice cream or frozen yogurt. The consistency would be more icey without the bananas. I tried my first “Yonanas” dessert using 2 frozen bananas and 1 cup of frozen mixed berries. I found the machine simple to use and the final product was delicious. You must remember to thaw the frozen fruit at room temperature for 5 minutes before putting it into the chute (or microwave for 20 seconds) or you will jam the machine. 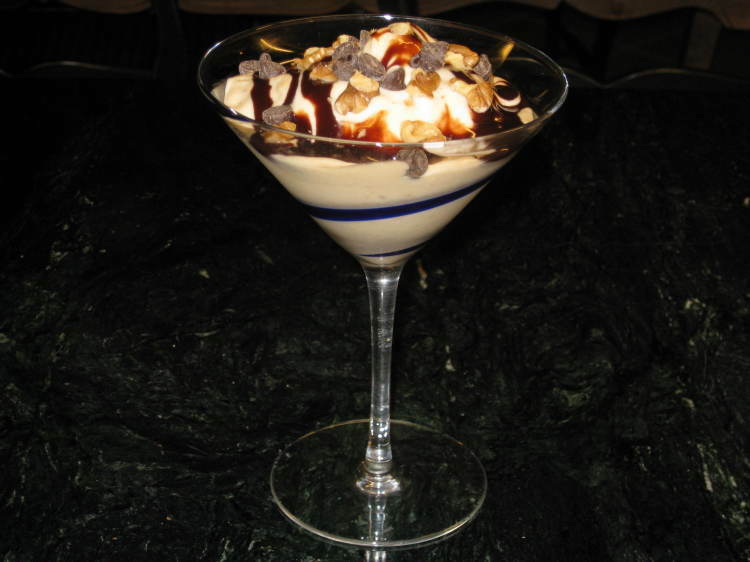 You may wonder if a blender or food processor can make the same dessert. According to the manufacturer, the “Yonana’s cold, creamy, soft serve, ice cream-like texture and consistency cannot be replicated by a food processor or blender.” I believe this statement to be true. This is a great little product which I highly recommend and which I’m sure I’ll use all summer long. The upper portion of the machine is removable for easy storage in a small space in your kitchen or cupboard. What could be better than that? Place 1/4 cup vanilla almond milk into blender or food processor. Then add the peanut butter and frozen banana chunks. Blend ingredients until mixed into a creamy texture. If you are having trouble blending, add a little bit more vanilla almond milk (but just enough to blend the ingredients together). When you are finished blending, separate the mixture into individual serving bowls. Squeeze the non-dairy chocolate syrup on top and sprinkle with chopped walnuts and vegan chocolate chips. Yum!!! My husband and I eat yonanas every night before bed…we love it that much. Our favorite is bananas with cherries. I top it with a sauce that I blend made out of a banana, cocoa powder, and unsweetened almond milk. 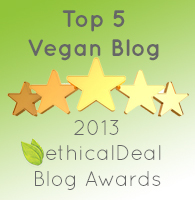 It’s the perfect vegan ice cream dessert!!! This sounds so delicious! I can’t wait to try that sauce!!!! 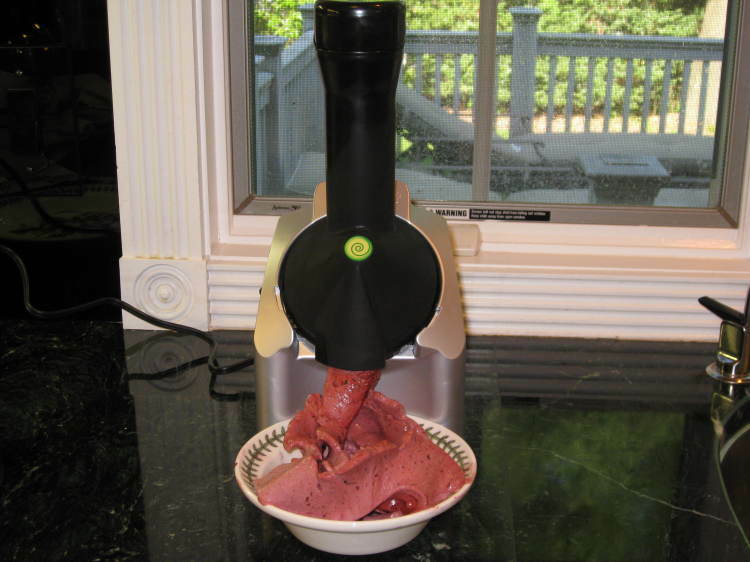 The Lovely Ellen bought us a Yonanas machine as a gift and we love it to bits! Best desserts ever, so nutritious and filling!! Isn’t it so much fun! Do you have any “chocolatie” (is that a word?) recipe for yonana machine? I love my yonana but miss the chocolate “ice cream” flavor once in a while. Hi Deb! I would mix in some raw cocao powder into the “ice cream” after your fruit goes through the Yonanas into the bowl. This should give you the chocolatey flavor you are craving. 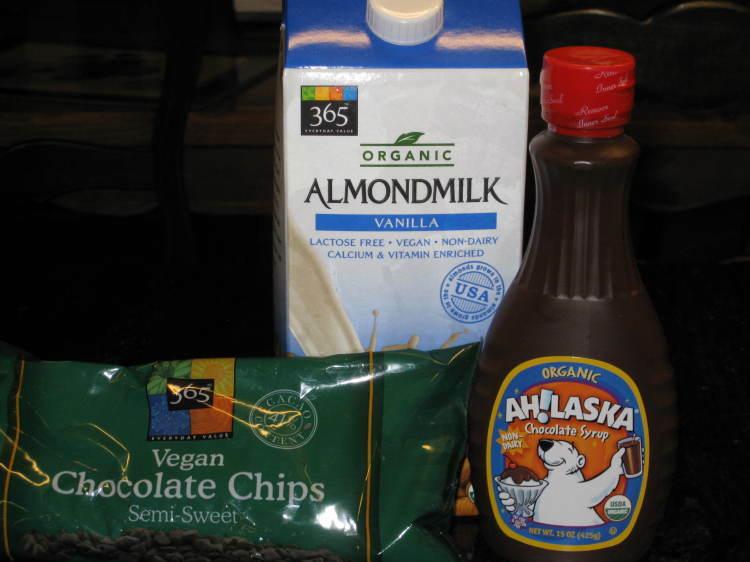 Or get the Alaska brand vegan chocolate syrup found in Whole Foods and pour it over your Yonanas “ice cream.” Or simply add some vegan chocolate chips to your finished product. But I think mixing some cocoa powder into the finished product would make it into a chocolatey “ice cream.” Hope this helps. But I will continue my search for a better recipe and, if it’s good, I’ll post it. I just saw a recipe mixing frozen bananas after going through the Yonanas with peanut butter and cocoa powder. Thought that might give you the chocolatey flavor you are looking for.